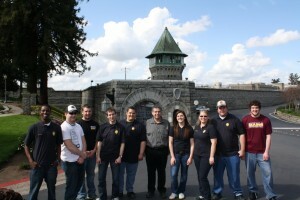 University of Maine at Presque Isle Criminal Justice Club members recently traveled to Sacramento and San Francisco, California, in conjunction with a course designed to increase student awareness of historical perspectives of policing and corrections. The trip included student ride-alongs with members of the Sacramento Police Department, visits to Folsom Prison, Alcatraz Prison, Berkeley Police Department, the California Highway Patrol academy, and various tourist attractions in the greater San Francisco area. The students who participated in the trip included: Christina Hall, Hanad Ashkir, Mark Bartlett, Tom Dionne, Josh Esty, Josh Conroy, Sierra Turmenne, Richard Landry, and Ben Lulofs. The trip also included visits to see Lombard Street (the most crooked street in the world), night life in San Francisco, the Golden Gate Bridge, and the Painted Ladies (the colorful Victorian houses depicted during the opening scene of the television series Full House).